In an interesting recent essay, Rodney M. and Mary R. Baine offer good evidence for proposing William Nicholson as the original model for Inflammable Gass the Wind finder in Blake’s An Island in the Moon. 1↤ 1 Rodney M. and Mary R. Baine, “Blake’s Inflammable Gass,” Blake Newsletter 38 (Fall 1976), pp. 51-52. It was this essay which drew my attention to Nicholson’s book. The weakest link in their argument is perhaps the merely circumstantial nature of the connections between Blake and Nicholson before the 1800s: “Blake is almost certain to have known Nicholson in the 1800’s; but he could have met him in the late 1770’s or early ’80’s.”2↤ 2 Baine, p. 51. In the same paragraph, however, lies a clue that, when followed up, provides the definite evidence missing in the argument. The Baines, in suggesting that Blake may have met Nicholson through the publisher Joseph Johnson, comment that Blake in 1782 may have “engraved some of the twenty-five unsigned plates for Nicholson’s An Introduction to Natural Philosophy, published . . . by Johnson.” Blake did in fact sign one of the plates in this book, for the vignette used on the title-page of both volumes of the first, 1782, edition (see illus. 1 for title-page) is unmistakably signed “Blake sc,” and there seems no doubt3↤ 3 The combination of date, publisher, and style of signature make this virtually certain. I do not know who designed the plate; it may have been Stothard, who designed many of Blake’s early plates for Johnson, but a search through the Stothard material in the British Museum Print Room failed to turn up any evidence. that it was indeed William Blake the poet who engraved this admittedly not very exciting temple of science in the clouds (illus. 2). The same plate has been used for both volumes; it is small (the plate-mark measures 81 × 44 mm. ), and the signature (illus. 3) very small indeed (approximately 3.5 mm. ), and quite faint. The signature is in fact at least as difficult to see as that on the small engraving by Blake on p. 127 of Vol. I of Lavater’s Essays on Physiognomy, which managed to escape detection for so many years.4↤ 4 See G. E. Bentley, Jr., “A ‘New’ Blake Engraving in Lavater’s Physiognomy,” Blake Newsletter 22 (Fall 1972), pp. 48-49. This does raise the possibility that Blake has placed other micro-signatures on plates which have been seen often without recognition. Obviously engravers made much use of magnifying lenses for their work, though Blake’s modest myopia5↤ 5 See David Bindman, ed., William Blake: Catalogue of the Collection in the Fitzwilliam Museum Cambridge (Cambridge: Heffer and Sons, 1970), p. 60. may have helped a little. It is not surprising that Blake adapted with great skill, if little enthusiasm, to the craft of miniature painting. The Baines’ essay suggests that Blake may have engraved some or all of the other plates in these volumes. That is certainly possible, but in largely technical engravings such as these are for the most part, it is impossible to draw definite conclusions in the absence of clearly defined stylistic features. The clumsy handling of the small temple on Plate XV of Vol. I, p. 281 (illus. 4), however, contrasts badly with the fineness of the basically similar temple in Blake’s vignette. Blake is known to have done the technical engravings for James Earle’s Practical Observations on the Operation for the Stone,6↤ 6 See Leslie F. Chard II, “Two ‘New’ Blake Engravings: Blake, James Earle, and the Surgeon’s Art,” Blake Studies, 6:2 (1975), 153-65. but they are again considerably finer than the work in the plates in the Nicholson volumes. In fact, Blake’s commercial work in this early period was usually small in scale and quite fine-toned, as demonstrated by such plates as those for The Poetical Works of John Scott (1782), The Novelist’s Magazine (1782-83), and Ritson’s Select Collection of English Songs (1783). Blake himself later took some pride in this early work, much of it after Stothard’s designs, and refers in the “Public Address” to “those little prints which I engraved after him five & twenty years ago & by which he got his reputation as a draughtsman.”7↤ 7 David V. Erdman, ed., The Poetry and Prose of William Blake (Garden City, N.Y.: Doubleday, 1970), p. 561. Further references to this edition will take the form E 561. My own view therefore is that it is relatively unlikely, though just possible, that Blake engraved more than the title-page vignette for An Introduction to Natural Philosophy. The work was popular, and went through five English editions. “The Second Edition, with Improvements,” is dated 1787,8↤ 8 An “Advertisement” in this edition states that “Many additional figures have been inserted in the plates”; proof that the same plates were used can be found on pl. 22 of Vol. II, where the original title of one figure, “Refractive power of the Air Fig. III, p. 57” has been altered to read “Fig. 130,” though the original “57” is still barely visible. and keeps Blake’s vignette, though in the British Library’s copy the signature is almost invisible. It would appear that the fine lines of Blake’s plate did not stand begin page 194 | ↑ back to top up to the heavy wear of substantial editions, for the third, fourth, and fifth London editions, dated 1790, 1796, and 1805, substitute a new and unsigned vignette (illus. 5) for the title-page, similar to Blake’s in general outline but considerably coarser. I do not know who made this later plate, but its style seems much too crude to be attributable to Blake. There were also several American editions of Nicholson’s work, the National Union Catalogue listing editions published in Philadelphia in 1787, 1788, and 1795-93 [sic]. Of these I have seen only the edition published in 1788 by Thomas Dobson; it is in one volume and is called “The Third Edition.” There is no engraving on the title-page; most of the other plates in the book are extremely close but reversed copies of the plates in the first London edition, suggesting that some process of tracing was used to make the plates for the American editions. 1 Titlepage of first edition of William Nicholson, Introduction to Natural Philosophy, London, 1782. 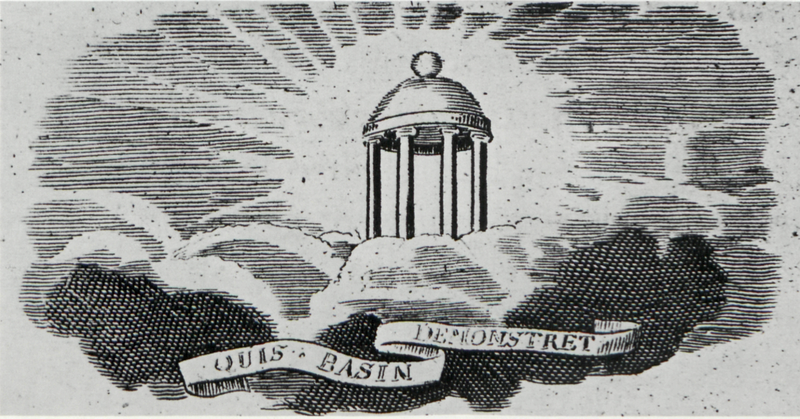 2 Blake’s vignette for titlepage of Nicholson’s Introduction to Natural Philosophy, 1782; plate size 81 × 44 mm. 3 Enlargement of Blake’s signature (3.5 mm.) from titlepage vignette. 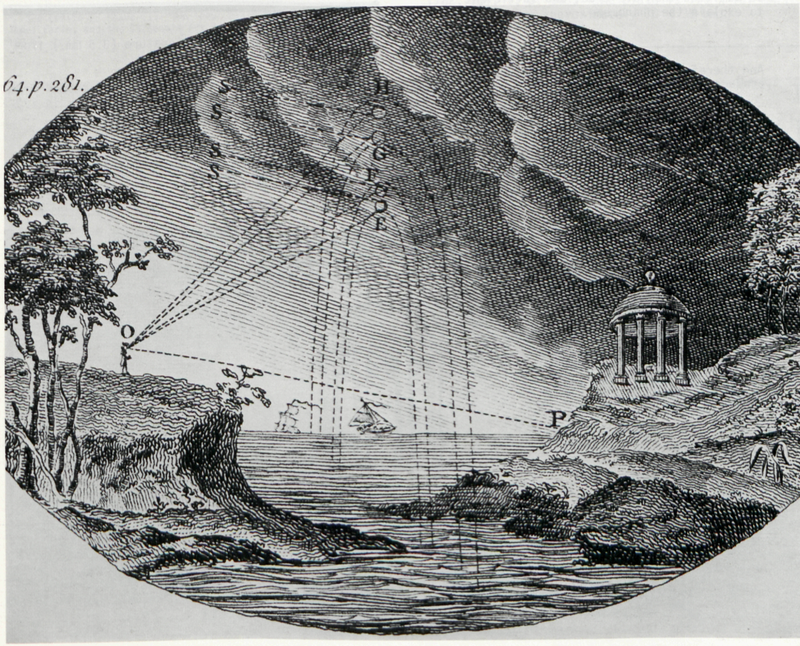 4 Figure illustrating “Theory of the Rainbow” from Nicholson, 1782; Vol. I, p. 281. The plate is 173 × 166 mm. ; this figure is 109 × 72 mm. begin page 196 | ↑ back to top publishers to present courtesy copies of books to their illustrators, but the evidence already offered by the Baines in their article suggests strongly that Nicholson’s An Introduction to Natural Philosophy joins such books as Lavater’s Aphorisms on Man and Stedman’s Narrative 9↤ 9 See David V. Erdman, Blake: Prophet Against Empire, revised ed. (Garden City, N.Y.: Doubleday, 1969), pp. 230-42. See also G. E. Bentley, Jr., Blake Books (Oxford: Clarendon, 1977), pp. 685-88 for books illustrated by Blake for Cumberland and Hayley that the writers presented to him. in the group of works that Blake both illustrated and used. With the confidence born of knowing for certain that Blake did illustrate Nicholson’s work, I would like to make a few further suggestions about the possible intellectual relations between the two men. The Baines state that Nicholson shared Blake’s “political and religious views.”10↤ 10 Baine, p. 51. This may well be true in general terms, but it would seem that the two were far apart on fundamental questions of method in the arts and sciences. Nicholson begins with an “Introduction” that defines “Demonstration” and gives three “Rules of Philosophizing,” in the following schematization: ↤ 11 William Nicholson, An Introduction to Natural Philosophy (London: J. Johnson, 1782), I, 6. No more causes of natural things ought to be admitted than are true, and sufficient to explain the phenomena. And therefore effects of the same kind are produced by the same causes. 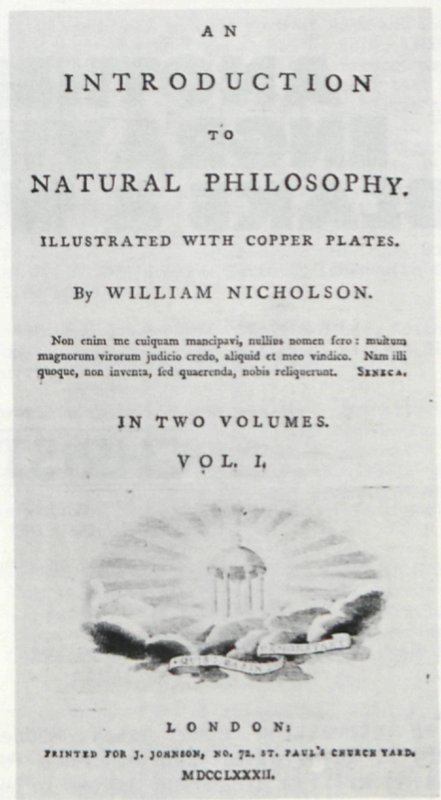 5 Titlepage vignette for Nicholson, Introduction to Natural Philosophy, 5th ed., London, 1805; plate size 78 × 43 mm. The mode of argument here is reminiscent of that found in There is No Natural Religion, and this added to the evidence that the Baines present for Blake’s mockery of Nicholson as Inflammable Gass suggests that Blake may have thought of Nicholson as a type of the rationalizing enlightenment mind intent upon narrowing philosophy to natural philosophy. In the world of the arts, it is worth noting that the first version of “Holy Thursday” cuts across and silences (for “a quarter of an hour”) the games that Inflammable Gass has been playing with his dangerous toys and “magic pictures” of fleas and lice (Island in the Moon, E 452-53). 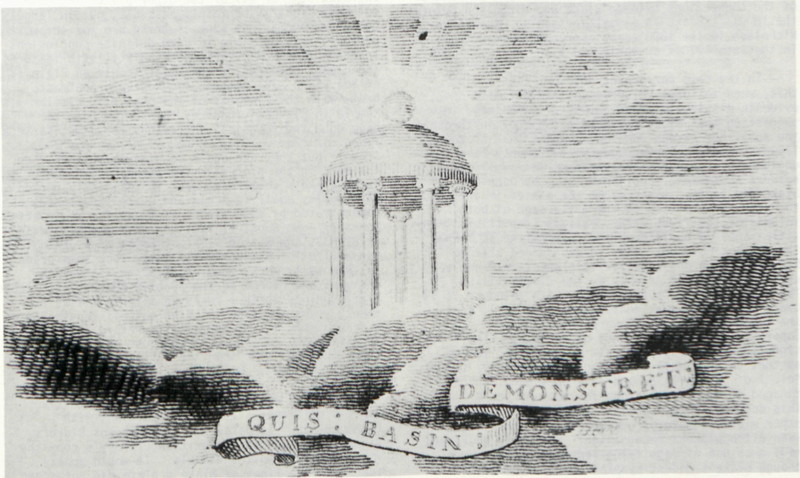 The Baines mention Nicholson’s camera obscura in reference to Inflammable Gass’s claim to own such a device (E 443). There is an illustration of one in Nicholson’s book (my illus. 6), and a description: “This is one of the most pleasing and delightful experiments in optics, and never fails to strike the beholder with surprise and admiration. Which indeed is not to be wondered at, for if there be any pleasure in contemplating a well executed painting, how much more begin page 197 | ↑ back to top forcibly must the attention be fixed when the painting is drawn by the unerring hand of nature?”12↤ 12 Nicholson, I, 368. In The Ghost of Abel, many years later, Blake stated that “Nature has no Outline: but Imagination has” (E 268); I suspect that even in the 1780’s Blake would have found Nicholson’s natural aesthetics as unsatisfying as his natural philosophy. 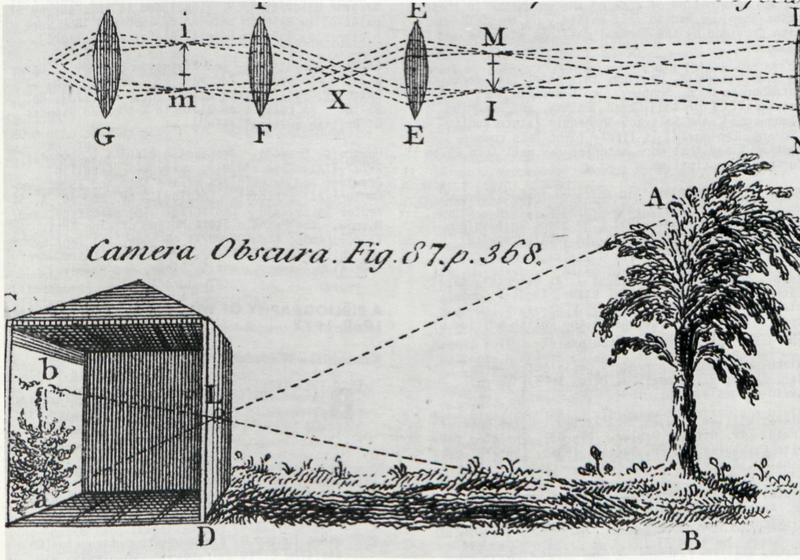 6 Figure of a “Camera Obscura” from Nicholson, 1782, Vol. I, p. 368. The plate is 170 × 161 mm., and this figure approximately 70 × 38 mm.